This week I completed shooting my fourth roll of black and white film. Again, it’s Kodak BW400CN. I have five or six shots from the roll worth publishing and will publish them on vufindr.com in the coming couple of weeks. 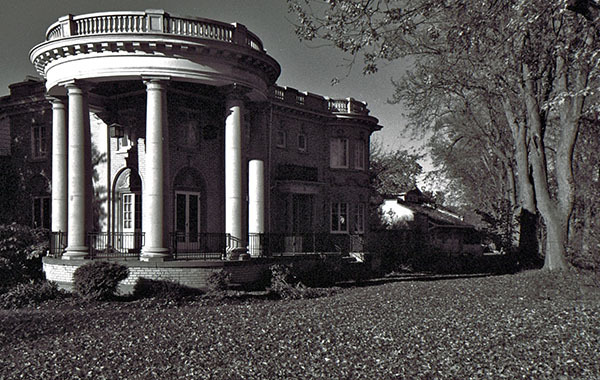 This photo is of the Rowell Mansion, corner of Richmond Avenue and Ellicott Avenue in Batavia. Rowell owned a box factory, but he’s more famous for getting away with murder. In 1883, Rowell found his wife in bed with another man. The discovery wasn’t a surprise, with a friend supplying a tip, so Rowell showed up with a gun. A jury found him not guilty of murder. The murder was on Bank Street. He built this house for his second wife.